Delilah Marlow’s life has been pretty normal throughout her twenty-five years. She’s wanted for nothing. However, things can change in the blink of an eye. Metzger’s Menagerie is back in town and features one of the most extensive array of supernaturals (or cryptids) found anywhere else in the country. Decades ago cryptids lived among humans by and large, but after a horrific incident referred to as “The Reaping,” anyone with any amount of supernatural blood lost all rights. Many are killed for sport, some are experimented on by the government, and others are prisoners in traveling carnivals. While visiting the menagerie on her birthday, Delilah sees one injustice after another. When she is at her limit, something happens to Delilah and the next thing she knows she’s now part of the travelling menagerie as a cryptid. Delilah is at once faced with her life being turned upside down. In the space of hours, she goes from being human with all the rights allotted to that title, to being property and having nothing. Slowly, Delilah comes to know her fellow prisoners, and realizes that the way humans look at cryptids needs to change, but first Delilah will have to learn to survive in her new environment. 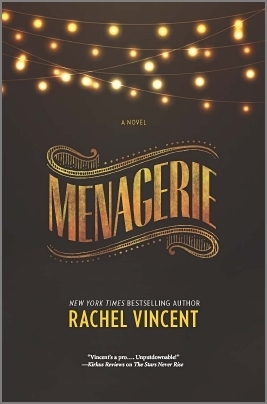 Menagerie was one of those books that I’ve being hearing about and waiting for, for years now. From what I understand this book was a long process for Rachel Vincent, and you can clearly see the care that this story has been given by the way it is crafted. Vincent takes quite a bit of time to set the scene, but as her words weave themselves into the story proper, I found myself enchanted by the often grotesque, sometimes beautiful, blatant commentary on humanity found within its pages. Rachel Vincent doesn’t pull any punches when it comes to showing what happens when people are faced with something they fear or something they don’t understand. At the end of this book, I have no doubts in my mind about what the majority of humans think about cryptids, but I don’t think the book would have had such a big impact if Vincent hadn’t decided to really push this point. Delilah’s situation was so bleak and she knew that, but she held on to her strength throughout the whole book. Though her thoughts raced back and forth between wanting to give up and wanting to fight back, I only think this made her more relatable as a character. I mean whose feelings wouldn’t waffle back and forth if all they’ve ever known comes into question? And when I say all, I mean all. I found myself constantly looking for acts of kindness in this book, and I was surprised when Delilah’s stoic handler Gallagher fits this bill more often than not. He actually talks to Delilah like she is a person and not a thing. He tries to go easy on her for all that he’s been instructed to “break” her. One wonders what his story is, and obviously there’s a mystery there. I rather enjoyed figuring out the pieces of his character. If you’re someone looking for a paranormal book without the usual players, you’ll really enjoy the different mythical creatures that pop up at the menagerie. For me, the main events in this book were pretty self-contained. The threads left open will definitely carry readers into the next book, but for this one the focus is squarely on the workings of the Menagerie. I loooooooove when Rachel Vincent goes dark. (See review of SHADOW BOUND: http://vampirebookclub.net/review-shadow-bound-by-rachel-vincent-unbound-2/) Very, very excited about reading this one. I’ve requested the audio book for this one and can’t wait for it to show up at my door.